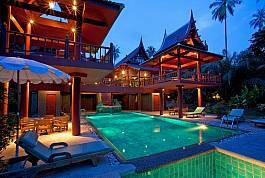 Hidden in the mountains of Nathon, on the North-Western Coast of Samui you will find Phukea Villa. This sizeable 6 bedroom Villa has modern décor with spectacular views which you can see throughout the Villa as well as from the private pool and terrace. Phukea Villa is perfect for families or large groups. 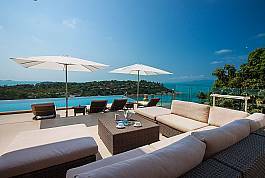 Located on the southern coastline of Koh Samui, Laemset Lodge is a six-bedroom villa sharing a small resort with just 8 other villas. 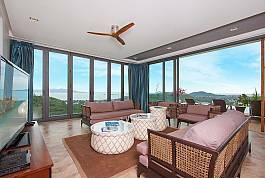 Basking near Laem Set Beach, this villa conjures up the ultimate holiday environment. The newly built Summitra Villa 6 bedroom, 7 bathroom holiday home offers luxurious comfort amidst contemporary furnishings and décor. Built over 2 spacious storeys’ it comes with every modern convenience, a magnificent infinity swimming pool with in-built Jacuzzi, and timeless views that will stay long in the memory. Adding to your leisure and pleasure you are also within walking distance of the scenic Choeng Mon beach with its beautiful white sand and inviting warm water. Those looking for the perfect holiday atmosphere of relaxation, calm and comfort will not be disappointed. 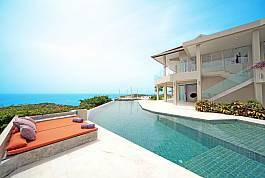 Spectacular views are offered by this dream villa located in the North East corner of Koh Samui. With copious open planning living areas, the villa has all amenities and leisure facilities on site, including fully equipped gym, infinity pool, sunbeds and sofas – all with amazing views of white sandy bays. A great villa for entertaining! Villa High Rise belongs to a 5-star property with several all-in-glass homes for rent. 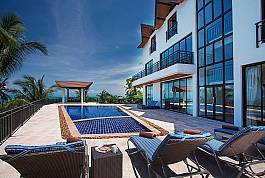 Set on Bophut’s hillside, the villa offers unparalleled panoramic mountain and sea views. Six bedrooms, private infinity pool with Jacuzzi, a pool table and many more features will welcome you on a holiday of a lifetime. Villa Alkira personifies what most of us would deem a dream-come-true vacation home. Set on a beachfront position at Lipa Noi in one of the most beautiful areas on Samui's western shore, the 6-bedroom property provides a refined getaway into a world made of luxury and style.